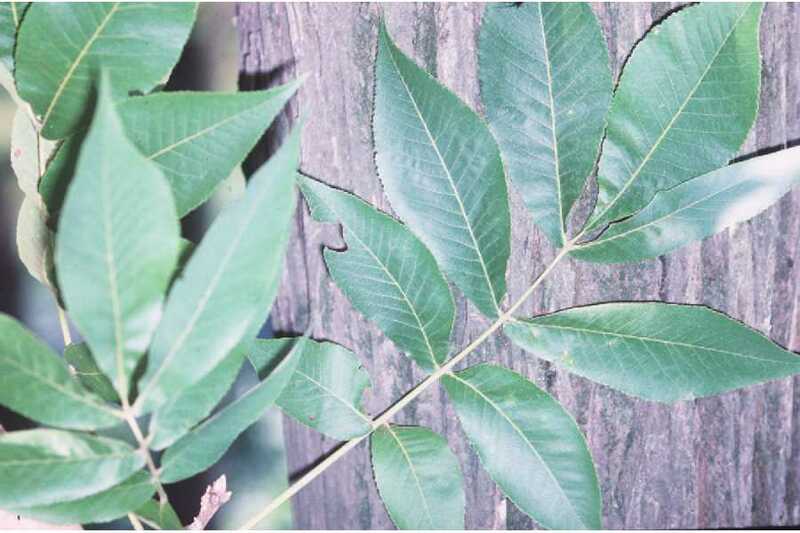 There are five kinds of Hickory Nut trees I am familiar with: The Big Shellbark Hickory (Carya laciniosa), the Shagbark Hickory (Carya ovata), the Bitternut Hickory (Carya cordiformis), and the Smoothbark (Pignut) Hickory (Carya glabra), and the Mockernut Hickory (Carya tomentosa). All you have to remember is the two you want to find for food are the Big Shellbark and the Shagbark. These two are very similar looking. 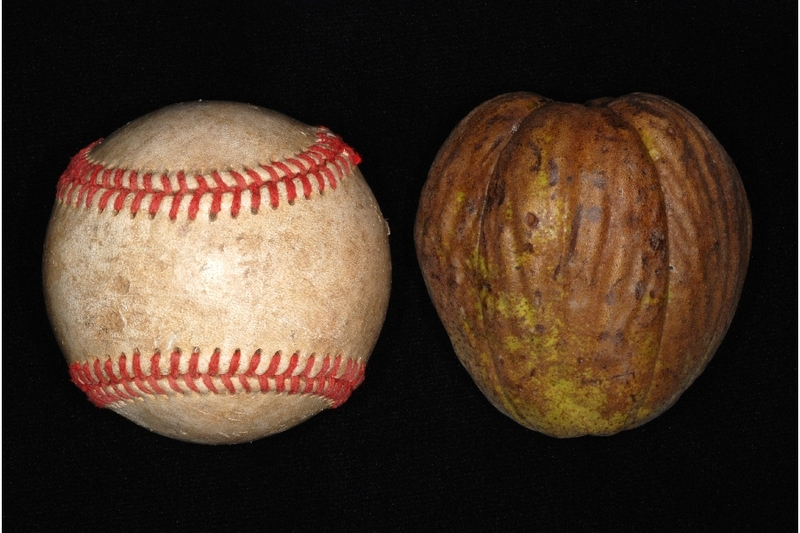 One way to tell the difference between these two is the nut is larger with the Big Shellbark. In the winter when the leaves are gone, the Shagbark is a sparser and more raggedy looking tree than the Big Shellbark which is a beautiful tree in the winter. And the easiest way in the fall when out gathering is to look at the compound leaves. The Shagbark usually has five leaflets per leaf, while the Big Shellbark has seven. 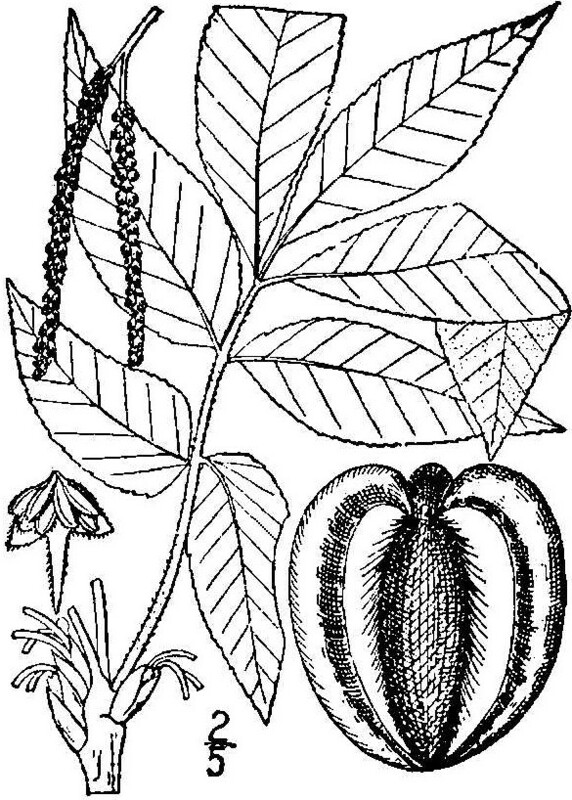 The Mockernut nut is also edible, but very small. The others have bitter nuts. 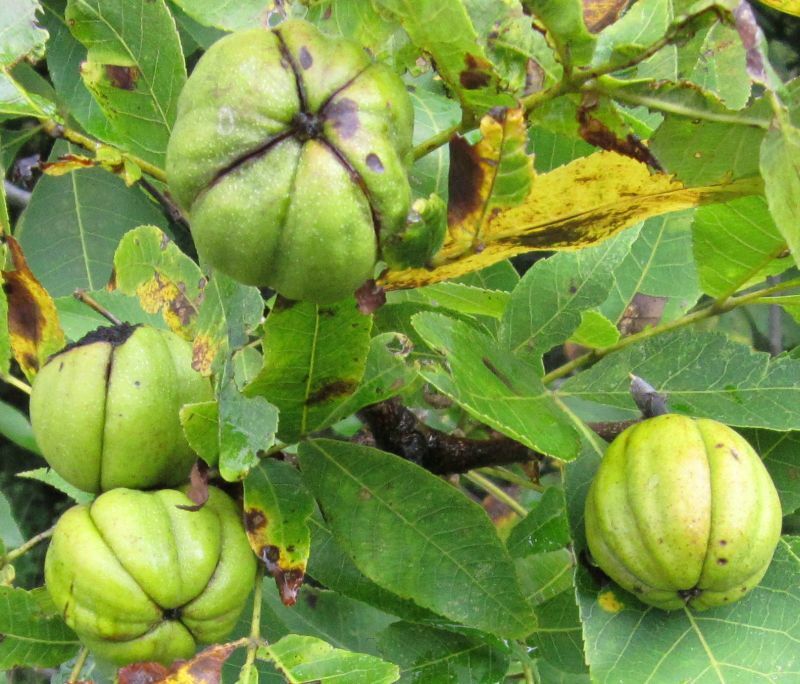 Hickory Trees are in the Walnut (Juglans) tree family, and Pecans are a type of Hickory. 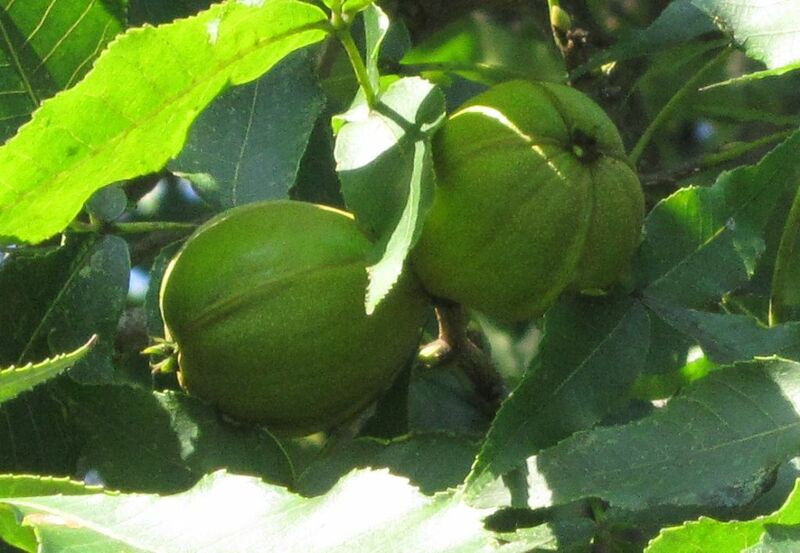 Planting: It's easy to grow them, just push one of the nuts into the ground in the fall about 5 cm (2 inches) deep. 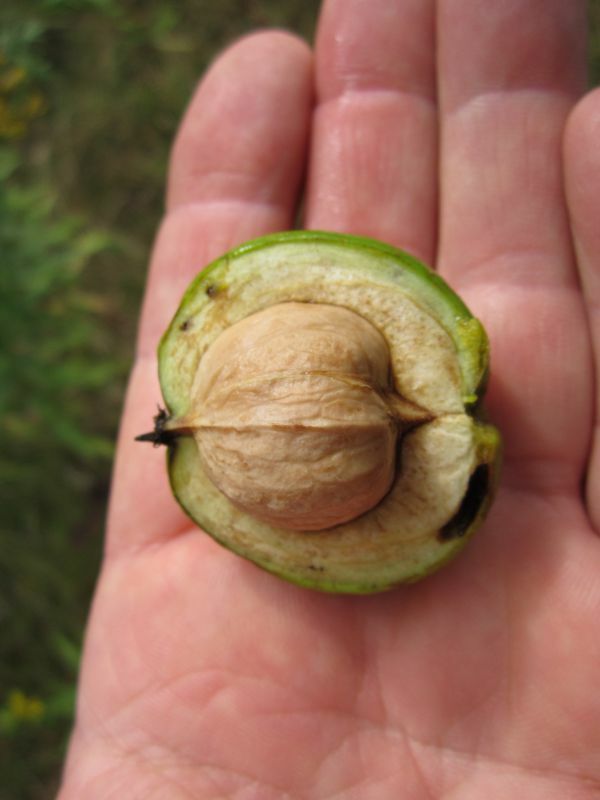 Read the Black Walnut entry for ideas on how to prevent squirrels from digging them back up. Now the bad news. From the time you push a nut into the ground to the time you get a crop of nuts is about 50 years or more. Too bad. However, if you are thinking of planting trees anyway for landscaping purposes, why not try these and do the next generation a favor. I've planted well over 100 in my time, and I often wonder how they are doing. In squirrel legends passed down from squirrel to squirrel, it is said that any human that plants a Shagbark or Big Shellbark Hickory tree becomes a worshipped one, and treated with favor by the squirrel spirits on the other side. Transplanting: Don't bother trying to transplant one, they have a very large taproot that heads straight down. By the time the tree is about a meter (3 feet) tall, the tap root is about 2 meters (6 feet) deep. Cut it, and the tree dies. Soil & Site: You can grow them in a very wide range of soils, but not strongly acidic. They do need to be planted where the soil is deep, no point planting one where there is only a meter (3 feet) of soil over bedrock. 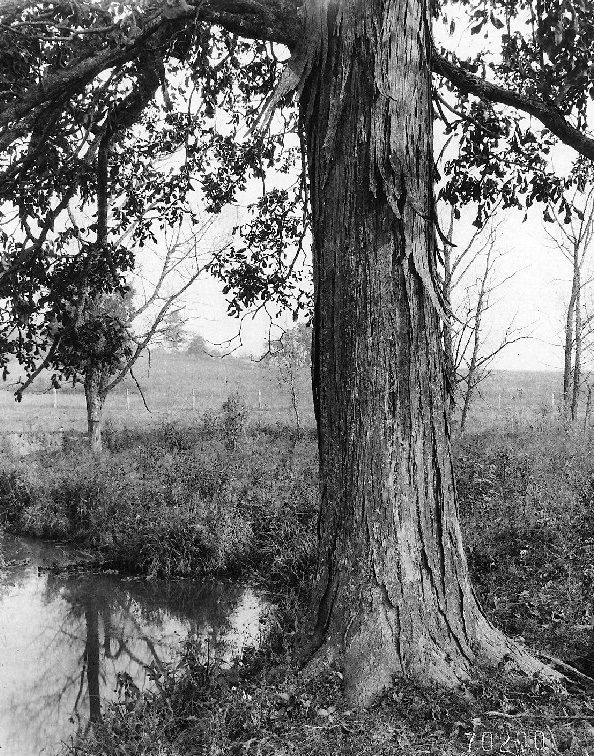 The Shagbark is more of an upland tree - no really low areas that flood, but the Big Shellbark is a lowland tree, that can take spring flooding. Maintenance: Once growing, there is absolutely nothing to do - no maintenance at all. Identification: To find, look for trees that the trunk is grey colored and the bark is quite shaggy in long vertical strips. The nuts of the good ones are easy to know from the ones you don't want – the good ones from the Shagbark and Big Shellbark have outer husks that are very thick and thick shells that are very hard to crack, while the bitter ones from the Smoothbark and Bitternut have thin, easy to crack shells and thin outer husks. Harvesting: Don't bother to look for them until late September to the end of October in my area. They are ready when the nuts start to turn from a leaf green color to a brownish color and the out husk splits open into four sections, and they start falling to the ground. The husks are so thick and bulky, I find it is better to husk them while gathering, rather than take them home husk and nut. The husks fall off with very little effort. If the husk is on tight, don't bother with that one, as in my experience, it means a worm has got into the nut. Using: You can eat them at harvest time, but they taste much better if you lay them out to dry in a dark, dry area. I find the basement near the furnace is best. By Christmas they are ready, and are good for years if stored properly. I have even had them quite edible after five years. They will attract mice and other rodents, so make sure wherever you set them out, these critters can't get to them. Cracking them open is an acquired skill, and my best advice is use either a vise, with the ends facing parallel with the jaws of the vice, and the thin side facing up and down, while the jaws of the vice are putting the squeeze on the wide sides. Make sure you are wearing glasses or safety glasses, as they can blow out sharp shrapnel when they do crack. That all said, the nuts of some trees do open better with the ends (top and bottom) in the jaws of the vice. You should experiment. I have never found it a good idea to put the pressure from the vice jaws on the narrow sides. The other way is to hold the thin section with your finger and thumb, with one side on a cement floor and the other wide side facing up, and the ends parallel with the floor. Hit with a hammer, starting softer, then adding more strength as you hit until you hear it crack. At that point either keep lightly tapping with the hammer until it opens, or open with a nut cracker. Shagbark Hickory (Carya ovata). 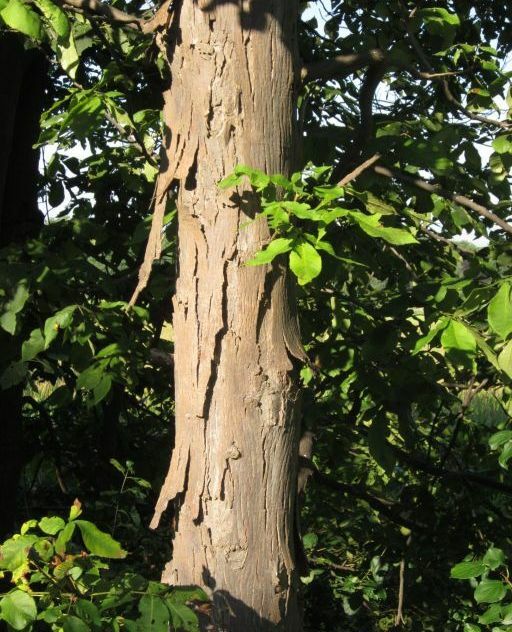 There are two varieties, the Northern Shagbark Hickory (Carya ovata var. 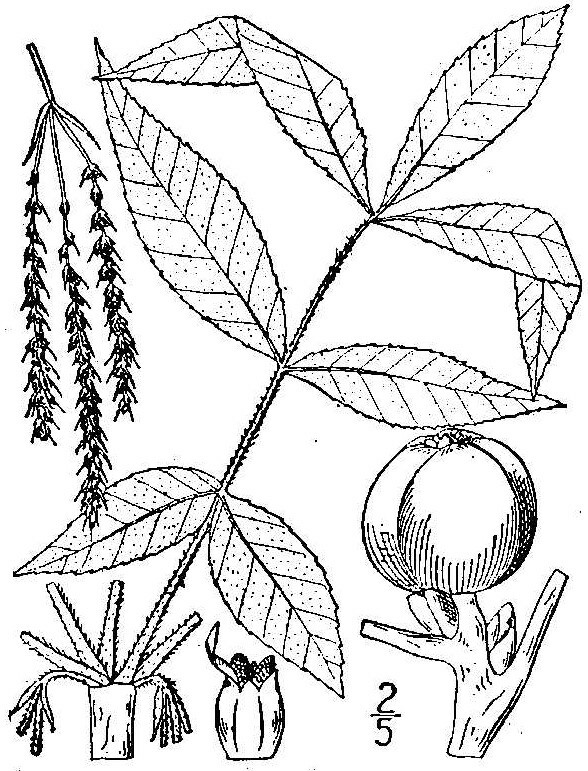 ovata) and the Southern Shagbark hickory or Carolina hickory (Carya ovata var. 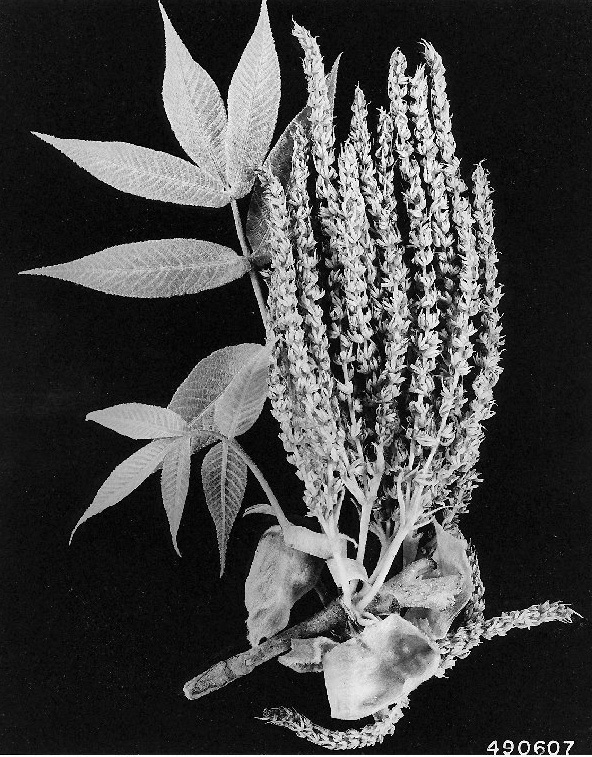 australis or Carya carolinae-septentrionalis). 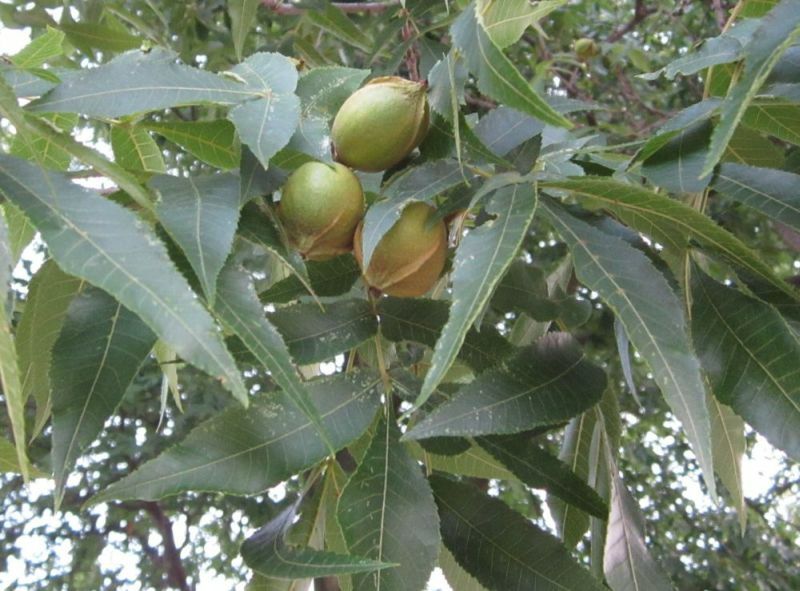 The difference is the size of the leaflets and nuts, the Northern has larger leaflets and nuts than the Southern Hickory. Though only the Northern variety occurs where I live, it is my understanding the taste of the nuts is the same with both. Soil pH: no numerical data, but lightly acidic to slightly alkaline. 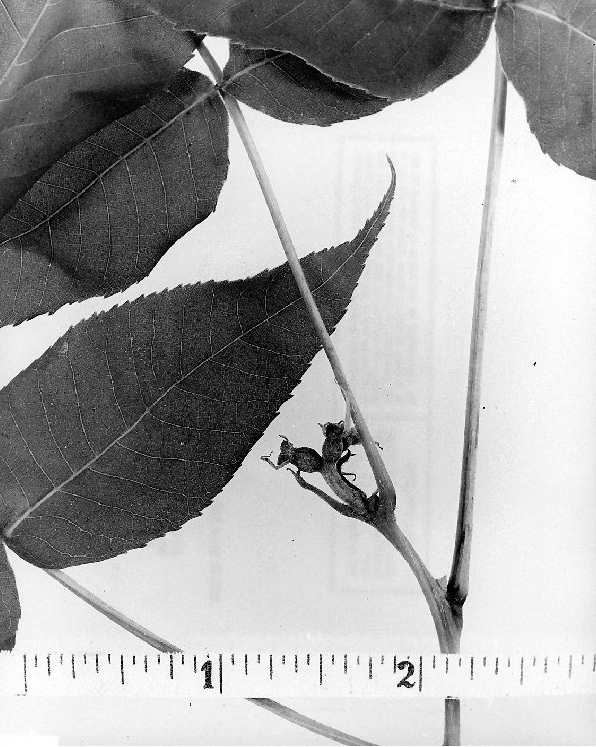 Leaf Shape: Compound, Odd Pinnate with Elliptic leaflets. Normally 5 leaflets per leaf, but on occasion you will find 3 or 7 leaflets per leaf. Leaflets are not the same size - the 3 at the end of the leaf are bigger than the 2 near the bottom of the leaf. Fruit: Nut (drupe technically) 2.5-4.0 cm (1 to 1 1/2 inches) long with very hard light tan wood shell, within in a thick husk that splits into 4 sections when nut is ripe. Husk is green when unripe, turns yellow and brown when ripe. Husk has strong, pleasant, distinct smell when ripe. Habitat: Tolerant of a wide range of soil and light conditions within its range. 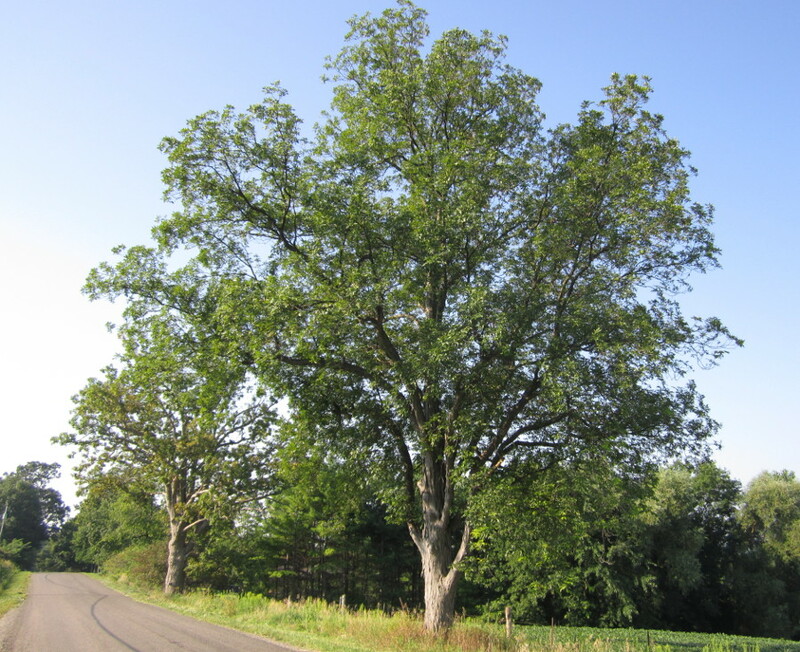 Shagbark Hickory (Carya ovata) range. 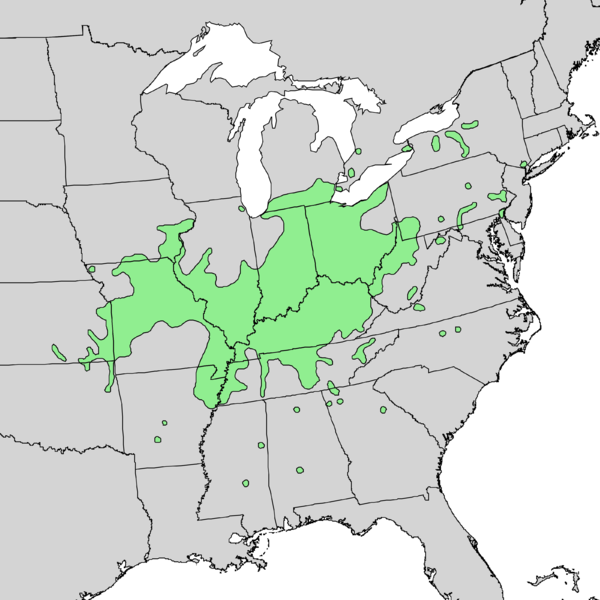 Distribution map courtesy of the USGS Geosciences and Environmental Change Science Center, originally from "Atlas of United States Trees" by Elbert L. Little, Jr. .
Trunk of Shagbark Hickory growing in open. Notice the light grey color of the trunk. I have noticed over the years that the ones growing in the open have shaggy bark, but not as much as ones growing in woods. Trunk of Shagbark Hickory in woods. This shows how shaggy Shagbark Hickories can be. This is typical for one in the woods. Shagbark Hickory Leaves and Nuts. Nuts of Shagbark Hickory still green with unsplit husks. Compare with the ripe ones in the picture below. If you tried to take the husk off, it would be difficult. When ripe, the husk will turn brown along the split lines and split open a little. These are ready. Many from this tree were on the ground already. Notice how thick the husk is. 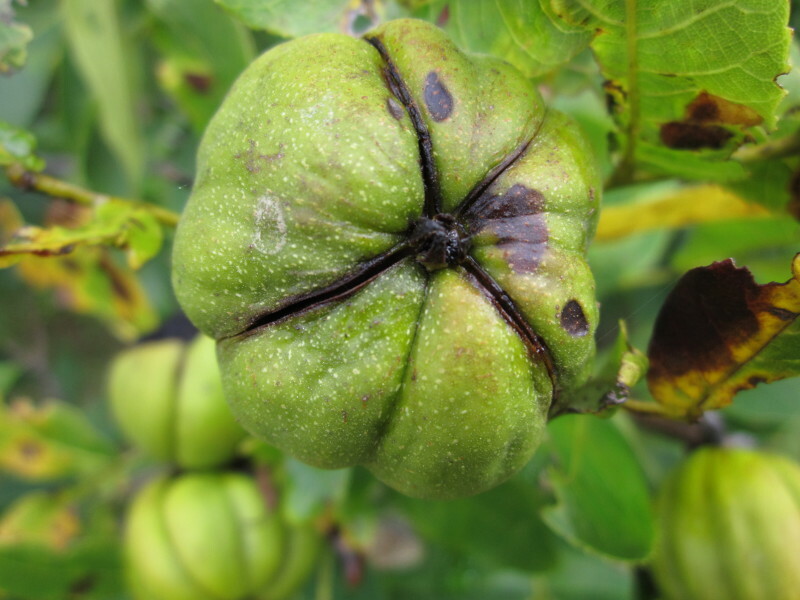 The husk should be easy to remove by hand when the nut is ripe and there are no worms in it. I've shown it in my hand for scale. Big Shellbark Hickory (Carya laciniosa). Known also as the Shellbark Hickory, Bigleaf Shagbark Hickory and Kingnut. Kingnut is the best name for this one as the nut is huge and spectacular in taste. It is a very rare tree in Canada, only found in the most southern parts of Southwestern Ontario - I have only ever found two in total. 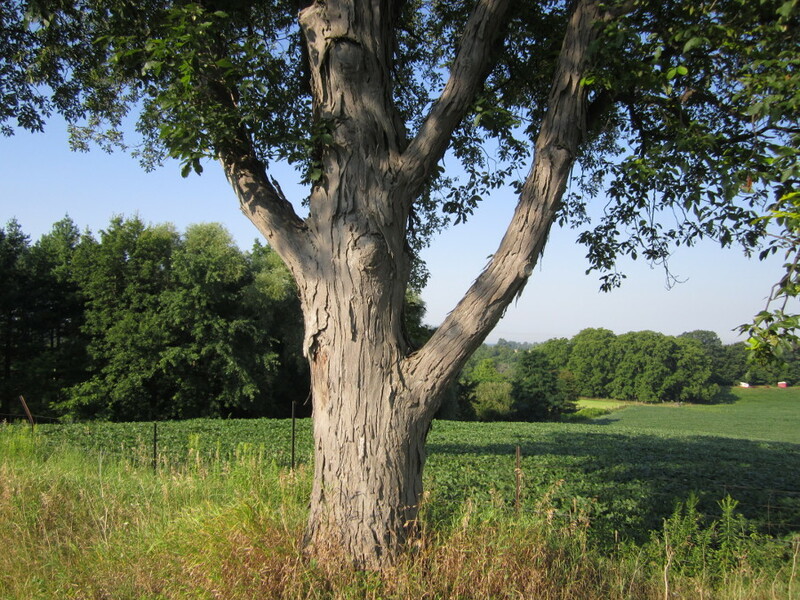 Even in the USA where it is more common, it is rare compared to the Shagbark Hickory. I have only ever found one in the London, Ontario area, and it was cut down to make way for houses. When I used to gather from it in the 1970's, the base of it was about a meter (three feet plus) at about chest height. It was an open grown tree, so it was very wide with huge horizontal, drooping lower branches you could climb up on. The end of the lowest branches drooped almost to the ground. Those side branches were as big as trees. I found that the nuts do not last as long in storage as the Shagbark, but that could just be from that particular tree. 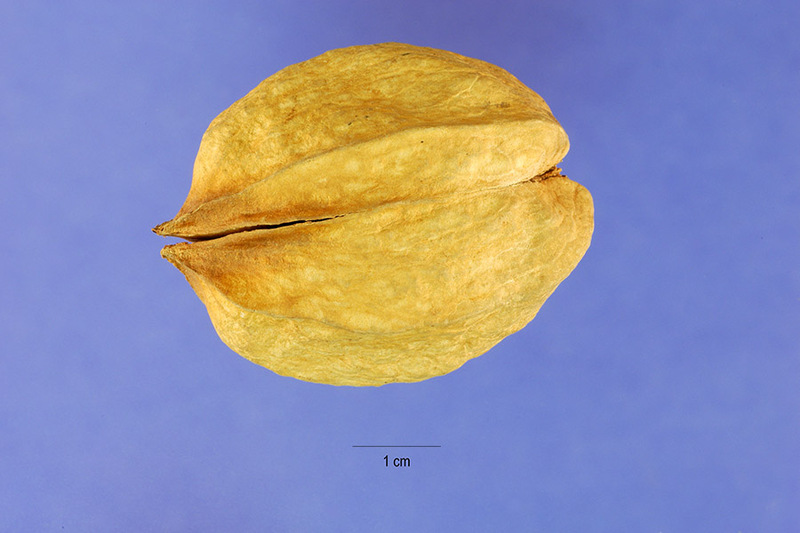 The nuts from that tree were often slightly split open and were irregularly shaped compared to Shagbark Hickories of the same area, though the taste was the same. I used to ride in road ditches to the tree in the fall on my minibike with a hammer in my backpack and eat nuts under the tree, then fill the backpack with nuts to the point of overflowing and ride home. The times doing this are some of my most fond memories. The other one I found was near Grand Bend Ontario, and interestingly the USGS map shows a dot at Grand Bend. USDA Plant Hardiness Zone: 5-8 (More information on hardiness zones). Soil pH: no numerical data, but grows in slightly acidic to slightly alkaline soils. 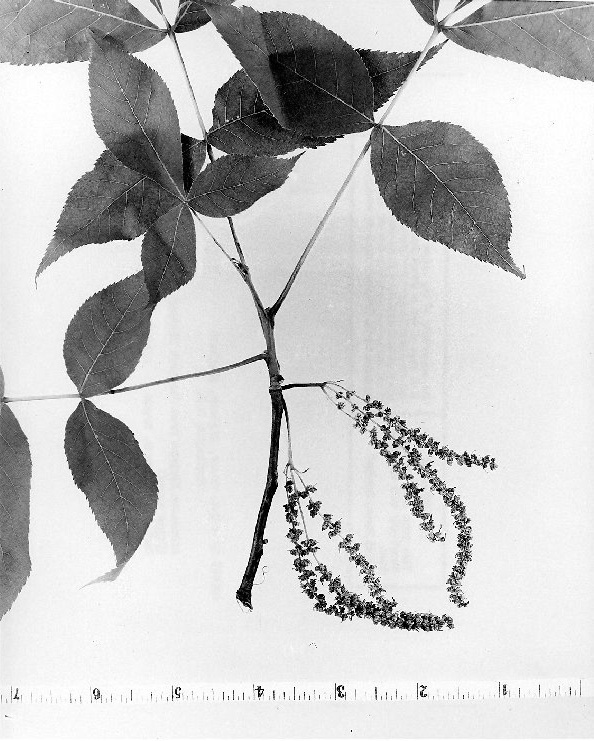 Leaf Shape: Compound, Odd Pinnate with generally 7 Elliptic leaflets, though there can be 5-9. Bark: Mature trunks are grey and shaggy like a Shagbark Hickory, younger branches are grey and rough, younger twigs are brown with small orange lenticels (checking). Habitat: Tends to be in lower lands that commonly have spring flooding. Big Shellbark Hickory (Carya laciniosa) range. Distribution map courtesy of the USGS Geosciences and Environmental Change Science Center, originally from "Atlas of United States Trees" by Elbert L. Little, Jr. . This is what you don't want. The nut inside looks very much like a Shagbark or Shellbark Hickory, but the husk is very thin and leather like. This one is a Smoothbark (Pignut) Hickory (Carya glabra). The bark looks similar to the bark of a White Ash with a criss cross pattern of light and dark lines - almost a woven look. The light lines are raised, while the darker lines are recessed. There is no shaggy quality at all. A Bitternut Hickory nuts look basically the same as the Smoothbark but the bark is very smooth and has a whitish color in the recessed vertical lines. Very smooth bark to the touch - almost a sanded and polished feel. Doesn't matter for food purposes, both have nuts that are inedible. These three are Smoothbark (Pignut) Hickory (Carya glabra) nuts. Don't waste your time planting these - they are not edible. 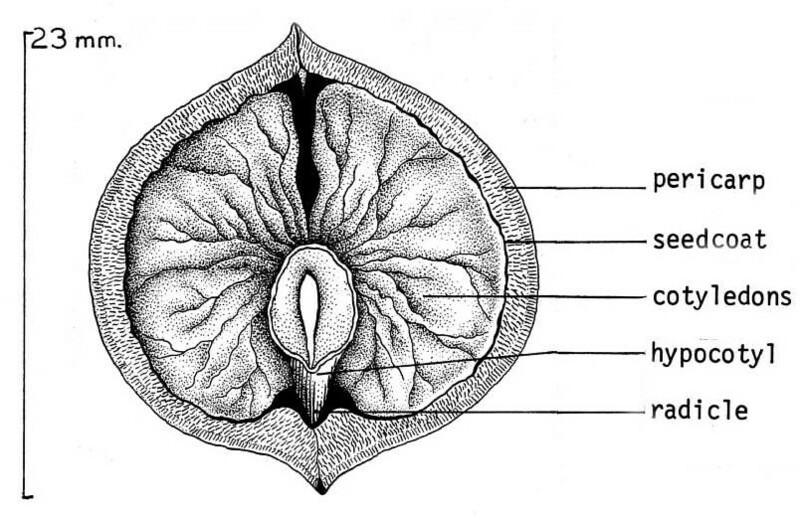 The Bitternut basically looks the same. Although some husks are very thin while others a bit thicker, all three are thin compared to the Shagbark or the Big Shellbark Hickory.